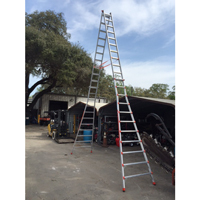 The Quantum includes the latest advances in ladder technology, making it lighter, faster, and easier to use than any other multi-use ladder. The Quantum features Little Giant’s new spring-assisted Rapid Locks™, which are easier to adjust than manual U-locks. The Quantum is compatible with the optional accessories the AirDeck™ workstation and the Quantum Step. Best of all, the Quantum is available with patent-pending Ratchet Levelers™, which adjust hands-free in seconds. These integrated leg levelers allow the operator to adjust to uneven ground in mere seconds. And when the job is done, the levelers retract into storage position. The levelers add only 6 pounds to the ladder weight and offer nearly 8 ½ inches of leveling adjustment.